“Spear” motif Counterbalance Windmill Weight made by the Challenge Co. of Batavia, Il., c, 1900-1920. 29 1/2″ long, 14″ high, 3 1/2″ thick. Weight about 35 lbs. Displayed on a custom made base. Large carved wood patriotic eagle with original gold, red, white and blue decoration. Excellent aged patina. A very fine example from the carvers of the Boston area in the mid 20th C. All original, no restoration. Found in a Florida estate of a New York TV personality. 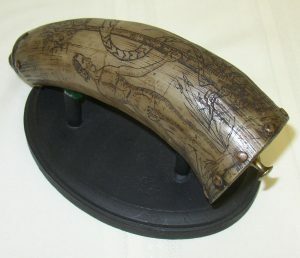 Very early Adam and Eve scrimshawed powder horn. 18th C. Rare topic for a horn. 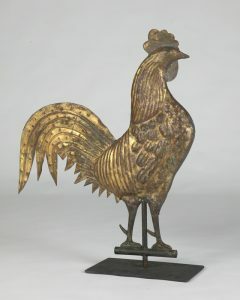 19th C. Rooster Weathervane with good old weathered surface, not original surface but very old with nice aged patina. Magnification reveals areas of verdigris, traces of reddish undercoat and areas of worn gold. Very good overall condition. No bullet holes, some minor pellet strikes, an old bend in the tail (properly straightened) and normal wear. Size is 22 1/4″ from top of comb to bottom of cross bar (add 1″ to bottom of rotation post), and 19 3/4″ from chest to tip of tail. From an old Ohio collection. 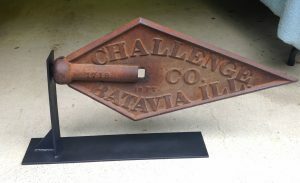 Displayed on a steel stand. 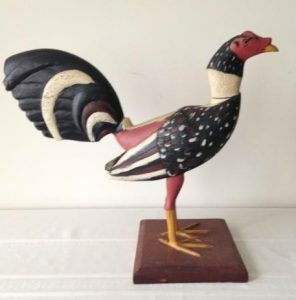 Carved and painted fighting Rooster, carved from cedar. Confidently attributed to master carver Don Emilio Rosado. Mr. Rosado was born in 1911 on the island of Puerto Rico. He died in 1996. He has many honors for his artistic work and carving of national roosters. He is a National Heritage Fellow and represented in many museums and noted collections. This Rooster is well carved with its original paint and represents many of Rosado’s key traits. Over all very good condition with some restorable losses to the wing tips. A real survivor with years of honest servoce to its line of owners in the State of Maine. 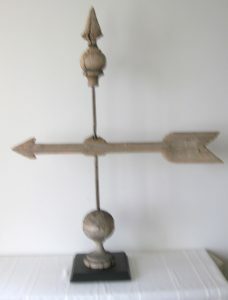 Second half 19th C. wood and iron weathervane with a 38″ wood arrow directional and nicely turned ball wood base, 46″ tall. Appealeing graphic design and physical appearance. All original condition. 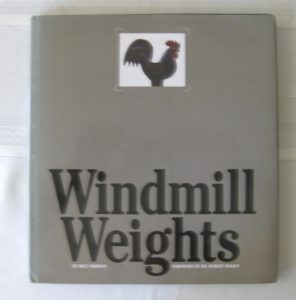 Windmill Weights by Milt Simpson with forward by Dr. Robert Bishop, 1985. The best existing documentation and photos of historical windmill weights. Published in association with the Museum of Modern Folk Art, New York. Color and black and white, 98 pages, hard cover with dust jacket. Very good condition. The book is out of print. We have 2 copies available. Price: $100 each, shipping included. 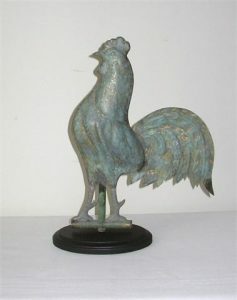 Unusual very small size full body Rooster Weathervane with embossed/molded sheet copper arched tail. Molded zinc legs and feet. Nice old in use surface. 13 1/4″ tall. 9 1/2″ wide and 1 3/4″ thick. From a MidWestern collection. 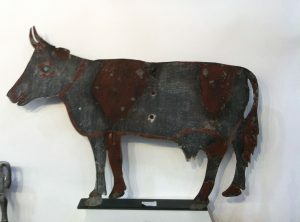 Late 19th-early 20th C. Cow Trade Sign cut from sheet iron and painted. Excellent original condition with good old aged surface. Freestanding on a metal brace.